In FSD’s May issue, we profiled Country Barbecue Co., a self-branded dining concept at Oklahoma State University in Stillwater that smokes brisket, pork, chicken, sausage and turkey on-site. 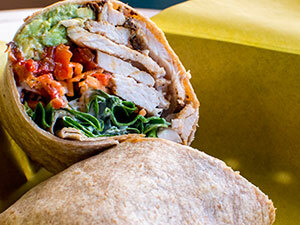 The Gobbler features house-smoked pulled turkey, avocado and veggies in a whole-wheat wrap. Check out Country Barbecue Co.’s Homemade Mac and Cheese and Smoking Gun Potato recipes. 1. Combine Greek yogurt and half of lime juice. 2. Combine avocado and other half of lime juice. 3. Lay out tortilla and spread avocado mixture on one half. Spread Greek yogurt mixture on other half. 4. Add smoked turkey, shredded carrots, red pepper and spinach. Fold ends of tortilla in and wrap, folding the bottom end over (like a closed burrito). 5. Slice in half at a diagonal, place on a plate and serve.